Like most of you, fitness is my passion but family is my life. When I had E and MiniE following my passion became a little more difficult. Luckily, my family knew how important it was to me and gifted me the best baby product I ever got. Not just because it’s awesome but because of what it afforded me. 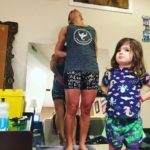 Getting that BOB stroller was a turning point in my fitness journey. 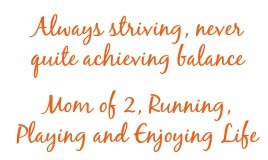 It allowed me to combine the two things I loved most…running and my baby. Then last year, I started talking to other running moms and realized we were a community all our own and dang it, we needed our own day! 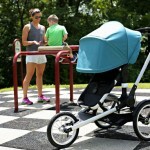 Running has a day in June but there’s something special about the stroller pushers. It takes an extra level of dedication and that dedication needs to be celebrated. 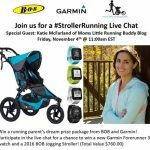 So on a whim, I reached out to BOB, the makers of my FAVORITE stroller and they loved the idea so with a little hard work, the first ever National Stroller Running Day was held in November. 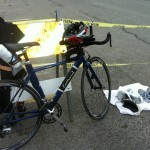 Read about last year’s fun! So many participated and had so much fun that we realized we had to do it again. We heard the feedback and decided immediately to change the date so that the weather was less of a factor. That’s why this year’s celebration will be on May 31st. BOB is back as the title sponsor and together, we have so much to share with you! 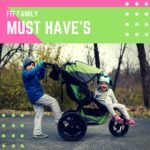 For starters, National Stroller Running Day has its own site!! You can check it out here! Browse it, bookmark it, and save it. That’s where you’ll find all the official event information, meet-up information, the official gear and so much more! I’ll warn you, the site is continuing to evolve so visit it daily! I’m really excited about how it’s coming together but it’s time to start getting excited. Don’t miss out on your chance to get a hold of the official gear. There are shirts for everyone, even your little running buddies. SHOP now! We’ll be taking pre-orders for about a week. Personally I’m really excited about the day for so many reasons. I can’t wait to see everyone’s pictures. Don’t forget to tag them with #StrollerRun15 to see them show up on the “Share” page. You can join me in LA on May 31st for the Club MomMe 5K event. I’ll be there representing BOB and would love to have you join me. If that’s not an option, schedule your own meet-up and submit the details so that you can meet all kinds of new friends! Check out the Events page. Wait…what’s that you say? You see a WIN page?! Yes, there are prizes and there are a few ways to win on there now but come visit often because there will be more prizes and more ways to win!! Register to win. There’s more but I don’t want to overwhelm. Spend sometime over on the site, get your gear and start planning! It’s gonna be a great event! Are you or were you a stroller runner? How do you stay fit with family? I so wish there had been something like this back when mine were little! Congrats on coordinating another great event. LOVE IT! Just shared on my blog–hoping to create a run/walk for my community as well! How exciting and I would love to join you guys but I don’t have any children. Congrats on your new program. I’m so excited for this great event! I’m moving to a new town about 2 weeks before #StrollerRun15 and I’m hoping I can maybe muster up a few new friends to celebrate stroller running!! I’ll be posting on my blog about it soon too!